We continue our look at one of our city's most important group of landmarks – its hotels, starting with another blockbuster built in the 1920s, the Essex House. In 1923, when Lodge No. 21 was built, it boasted more than 5,000 members and was considered by the Newark News as, 'the best Elks headquarters in the county'. A bond issue had been floated to finance the headquarters. Like its counterpart the Newark Athletic Club, it, too, was eventually converted to hotel status as the Depression ate away at its membership and financial clouds continued to descend upon club activities. So handsome was the Essex House that in 1975 the New York Times described it as 'a haven for New Jersey's social elite that has become vacant and vandalized and soon will fall victim to a wrecker's ball.' In happier days, it seemed as if the good times would last forever. In 1924, the 1,800 pound chandelier hung in the main ballroom or Lodge Room. The dedication party continued for three days as more than 10,000 Elks and friends, who came from across the country, took part. The first four floors of the extravagant building contained lounging rooms, a six-lane bowling alley, and a pool, and billiard room with 16 tables. The fourth floor included a large pool, gymnasium, and shower rooms and lockers. The upper floors contained 150 bedrooms. While the depression sealed the old club's future, financial problems began before the 1929 crash. In 1926, the Elks filed suit against 700 prospective members who had pledged to buy bonds and reneged. To remedy the situation, the dining rooms were opened to the public; then, the entire facility was made public. By 1933, the Federal Trust foreclosed on the property and established the Hotel Elton, which in 1942 was changed to the Essex House. Abraham Ellis bought the building and turned the bowling alleys into a nightclub, calling it the Carousel Room. For the next 20 years the Carousel remained a favorite spot of politicians and Newarkers, but as the 1960s approached, business began to decline and the hotel finally closed in 1968. The Georgian-style tower in south Broad Street was an anchor of the Lincoln Park district, a well-known landmark. The New York Times wrote that the once-glamorous building came to an end because of the 'economic realities of declining income and rising taxes.' And, so The Grand Dame of New Jersey hotels was officially dead. In order to save the physical structure there was talk of turning the structure into a new Essex County Youth House. For a time, it housed welfare families. But Newark Health Officer Dr. Aaron Haskins ordered it closed. A last attempt to save the hotel came from the Essex Plaza Company of Freeport, Long Island, which had purchased the adjoining Newark Industrial Office Building. But the building's conversion simply was too expensive. According to one local member of the Elks, the Essex House, formerly Lodge 21, died because 'People just left this city and went elsewhere. We only have about 500 members now. Then we had 5,000. They all left.' But ask any 'old time Newarker' about hotels and changes are they will remember it fondly. The Riviera Hotel, completed in 1922, at 169 Clinton Ave., was the last of the great thriving downtown hotels before the Depression engulfed the city. In 1949, it became the Divine Riviera Hotel. The building is an eight-bay trapezoidal structure facing Clinton Avenue and High Street (King Boulevard). Its doorways are its principal architectural feature. The elaborate corner facade entrance is a coffered polychromed barrel vault, and well worth looking at if you are in the neighborhood. The Clinton Avenue entrance includes a projecting canopy. Six classical two-story arches face Clinton Avenue, and four look onto King Boulevard. Six brick stories separate the arches from the ornate attic to complete the structure's tripartite horizontal division. Decorative terra cotta relief panels crown the building. In many ways its classical motif is similar to the New Tremont Hotel on Fulton Street. The building site was at a busy intersection at the foot of a steeply sloping King Boulevard. The Riviera was built at a time when the southern end of High Street was identified as one of Newark's silk stocking districts. At the time, the street was host to several important Jewish landmarks that included two major synagogues and the YM-YWHA. 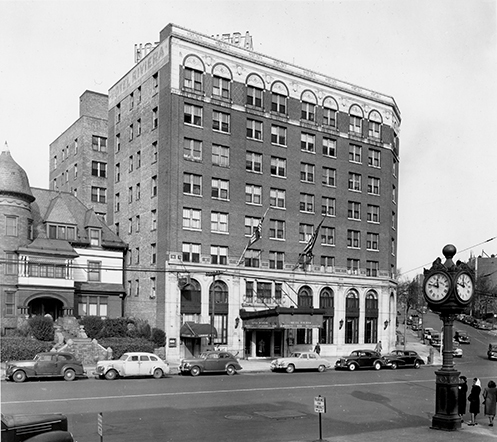 In 1949, the hotel was purchased by Father Divine. For many years it remained closely associated as the center of his church's Newark activities. Recently the Divine Riviera passed into other hands, closing another chapter in its history. The completion of the Douglas Hotel ended an era of big-time downtown, pre-Depression hotel construction. The hotel was finished right before the economic carpet was pulled from Newark and the nation in 1930. The Douglas was designed by Newark architect William E. Lehman in the Art Moderne style 'clad in terra cotta with minimal ornamentation at the base and a matching brick body rising to a height of 14 stories. By 1972, The Star-Ledger reported the Douglas was losing $30,000 monthly, had a 30 percent occupancy rate and was up for sale. It is the New Community Douglas Apartments in 1999. Smaller hotels that deserve mention along with the big establishments of the 20th century include the Elberon at 1007-1009 Broad St., built in 1905 and now the Central City Apartments. The Elberon eventually became an apartment house, retaining the characteristics of its hotel days. Its six stories and elegant facades show traces of a classical feeling and support a dual fire escape spanning its two central bays. It stands on the corner of Broad and West Kinney streets. The Tremont Hotel, formerly the Fulton Hotel, is located at 16 Fulton St. Built around 1915, it has a rectangular plan of five stories by an unknown architect and builder, and it too exhibits classical style including ornamented patterned work. Its decorative fifth floor windows are the building's best architectural feature. The structure is considered of value to the Military Park Commons Historical District. A state architectural inventory in 1985 described it as 'adding variety without dominating the streetscape . . .' No longer in existence, but highly important between 1931 and 1941 was the City Lodging Home, which had a fine reputation as a 'place to sleep and get a bite to eat in the Depression's darkest days.' Demands were so great that in 1932 it was enlarged. It provided a million nights of lodging for the depression homeless.